I love baking mostly breads,cakes, muffins and cookies, a few pies and adding to the list a new passion, scones. To share my love for baking I started ONLY BAKES group on Facebook. I invited my family members, friends and a few blogger friends to join the group. I started the group in February 2016. Initially I had just a handful of people who joined the group. Slowly, some members and blogger friends like Saswati, Jolly, Nisa, Gayathri, Shobha,Avin, Latha began to post their bakes on the page. For a couple of months I thought,”Gosh, I’ve started a group and its got just a few members.’ Then suddenly membership requests began to pour in and now there’s no looking back. Right now as I write this post we have over 6000 members. I find that some members share really interesting bakes, some are very creative and some just want to collect all the recipes in the world. At this point I would like to mention that even though we are members of many groups on Facebook, etiquette still has to be maintained. Some forget words like please and thank you and demand a recipe. Its very disheartening to see in the comment section of a photo or recipe you have posted, rcp…. I didn’t even understand that till my neighbour mentioned that it means recipe!! I was totally taken aback. No nice words or anything! Its always nice to encourage people who have taken time to prepare, photograph and share a recipe by commenting. This encourages them to share more with you. Learning from young or old should never stop. No one on this earth is born knowing everything. Learning from others is a satisfyingand uplifting experience. Since a lot of the members were asking for recipes which is not a criteria for posting on ONLY BAKES, I decided to start a monthly challenge. This would also help new bakers to build up their confidence and bake new things, baking together is enjoyable and sharing what others have baked is fun. 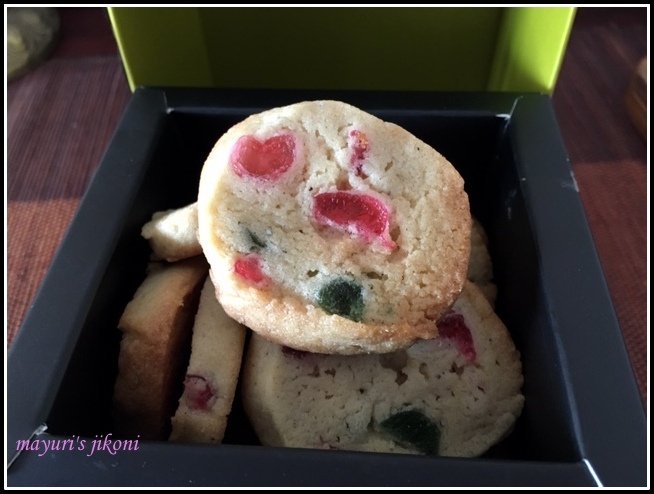 Vandana Jangid a member in the group baked Karachi cookies, photographed and posted it. They looked absolutely tempting and yummy. I read the recipe and it was very easy to bake them. So I set Karachi Cookies or biscuits as they are called as the challenge. Thank you so much Vandana Jangid for sharing the recipe with the group. Karachi cookies or biscuits are not from Karachi at all. They are very famous cookies baked at the Karachi Bakery in Hyderabad. Khanchand Ramnani, a Sindhi who migrated from Karachi to Hyderabad in 1947, started Karchi Bakery. He set up the first shop in Moazzam Jahi Market and till date has many branches not only in Hyderabad but also in Dubai, Mumbai, Vizag. What’s so good about these cookies? Well firstly these buttery cookies do not contain any baking agent. Secondly they are fruity. Tutti frutti is added to the dough, speckles of red, green , yellow show up against the light cream background. Nowadays other dried fruits too are added like raisins, currants, cranberries and nuts too. Rose essence is added to the dough to give it an exotic taste but some prefer cardamom. When baking these cookies, I found that once the ingredients at hand, they are the easiest and most delicious cookies to bake. Put butter and sugar in a big bowl. Cream sugar and butter with a whip or spoon till it becomes soft and appears a little white. Add the cardamom powder and milk. Mix well. Add the flour and mix with a spoon till a soft dough is formed. The dough will appear too soft. In the meantime get the cling film,foil or plastic sheets ready to wrap the dough. Gently roll each part into a long thick cylinder or rope. Wrap it up in the plastic sheet,foil or cling film. Leave the dough in the freezer for 30-45 minutes. Cut the dough into slices about ¼” thick. Bake the cookies for 8-10 minutes till the edges appear light brown. Leave the cookies on the tray for 5 minutes. Then slowly remove them from the tray and let it cool on a wire rack. Store the cookies in an airtight jar. I had doubled the recipe, so I had four rolled parts. I left 2 in the fridge till I baked the other 2 first. Don’t over bake these cookies. At first they will appear soft but on cooling they become crunchy. I used red and green cherries instead of tutti frutti. You can add any dried fruit or nuts of your choice. Use rose essence instead of cardamom powder. The number of cookies you get from the dough will depend on how thick or thin you roll the dough into a long rope or cylinder. I made small ones. These cookies taste so delicious with masala tea. If you want to join the group click here. Karachi cookies looks delicious and perfect. Cookies from my home town.. they are so delicious! Very well made and I must make them too.. haven't given them a try as yet. And they are easy to make Heidi, with Indian flavours. So you must have tasted the original cookies Shobha. Try them,they are tasty. tasty looking cookies and nice images.